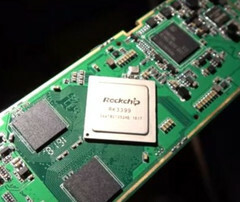 The chip that Rockchip unveiled back at CES 2016 is now ready for mass production, so the first devices to use it should hit the market in the coming months. Rockchip has unveiled the RK3399 processor back at CES 2016 and now it looks like this new ARM chip is already near the mass production stage. According to ARMdevices, this "dual-core ARM Cortex-A72 with quad-core ARM Cortex-A53 big.LITTLE at 28nm with ARM Mali-T864 GPU is ready for mass production." The same source mentioned above revealed an ultra-slim tablet powered by the RK3399 that features dual USB Type-C for charging, data, and display output. In addition to tablets, this new SoC is also expected to power notebooks, TV boxes, and even VR headsets. Its features include Mali-T864 graphics, 4K video playback, HDMI 2.0 output, and more. ARMdevices expects to see the RK3399 inside much more than the above, also mentioning Chromebooks, Windows 10-driven devices, set-top-boxes, robots, and more. Since this chip should enter mass production soon, first commercially available products powered by it should come out soon as well. We will write about them as soon as they come out, so stay tuned.